Beeswax is truly wonderful stuff. It can be used in lotions and salves or made into candles. Shoes and boots can be waterproofed or polished with beeswax and it can be rubbed on metal tools to keep them from rusting. I have even used it on wooden drawer slides so they slide better. If you are buying beeswax from a large supplier for a project where you will be melting it look for it in little pellets as it is much easier to measure how much you need. Beeswax in a big block is surprisingly hard to cut as it sticks to your knife. I supposed you could try a thin wire, something like a piano wire or guitar string, but I can’t comment on how well that will work. I get my wax from local beekeepers and a small amount from my own hives. Hopefully my production will go up when I learn how to keep a colony alive through a Michigan winter. 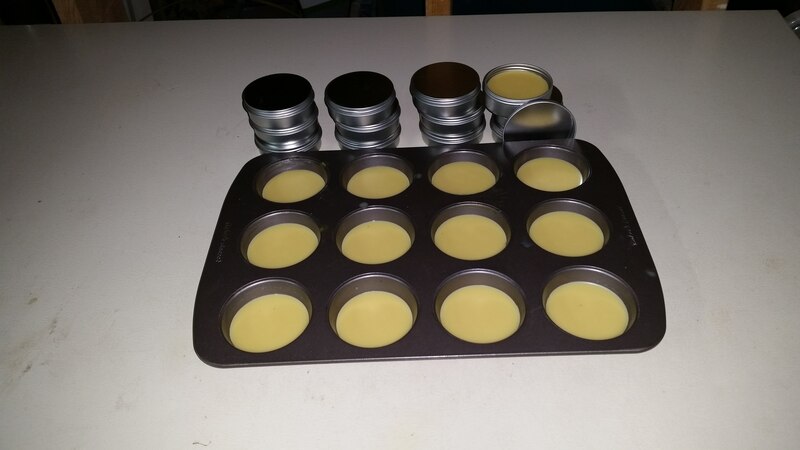 For what I do I generally use the wax in 1 oz increments so I melt it and pour it into a muffin tin, a bit over half full is 1 oz and full it is 2 oz. My stock of these was getting low so I decided to melt the 2.5 lb block I got at the farmers market in summer. I found a mold that will hold 1 lb and creates brake lines for 16 squares of 1 oz each. Plus as an added benefit it has a little bee in the center of each square. A word of warning, do not melt wax in anything you want to use for cooking again, you can never get all of it off. I picked up a 4-piece set of stock pots from Harbor Freight for about $20 that keep me out of trouble with my wife. 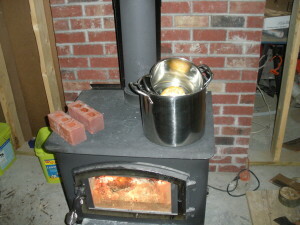 In the wintertime I like to melt my projects using our wood stove. To prevent scorching I do the double boiler method, that is have a larger pot of water with a smaller pot floating in the water and what I’m melting goes in the smaller pot. This way it will never be more than 212 degrees (the boiling point of water) so there will not be a hot spot that could burn what I’m working with. When the wax was melted I poured 1 lb into my nifty new mold and the rest into my old standby, the muffin tin. The first time you melt wax from a beekeeper there will usually be a little bit of sediment in the bottom that I try not to pour into whatever I’m making. Wipe it our of your melting pot with a piece of paper towel and you will have the best fire starter you have ever seen. 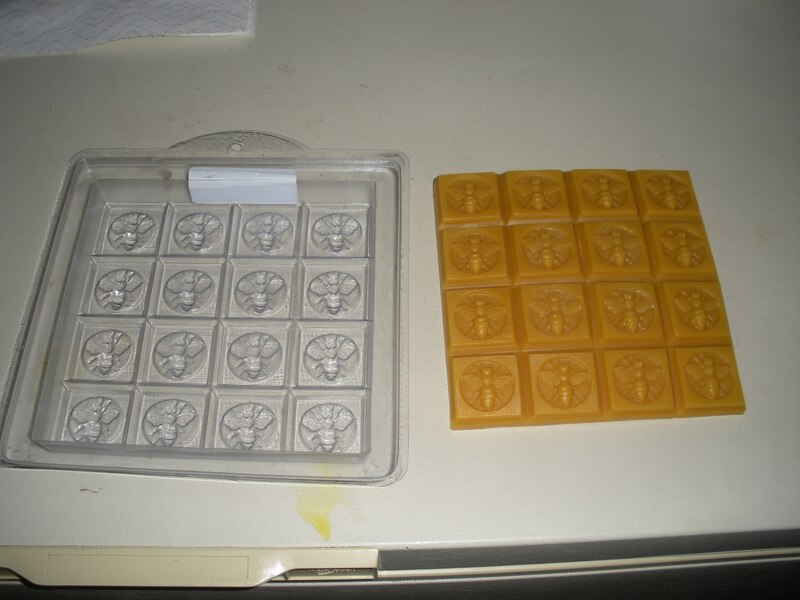 It takes wax a fair amount of time to cool and it shrinks a bit so it will separate easily from the mold. I liked my little squares so much I went ahead and re-melted another 1 lb batch from my muffin tin and cast them into the 1 oz squares as well. Lastly let me say it smells amazing so consider beeswax for one of your future projects and try to buy your wax from a local beekeeper. There is usually someone selling honey at any farmers market so you can ask there. Also you might be able to save some money by offering to buy the “cappings” without the beekeeper processing them down to wax. The cappings are what is cut off the honey comb when honey is extracted. 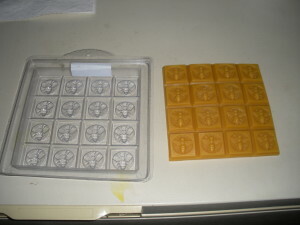 You will need to mix them with water and heat the mixture until the wax melts and floats to the surface. 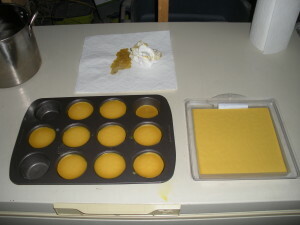 Let that cool and you will have a cake of wax with some crud stuck to the bottom that you will want to scrape off. 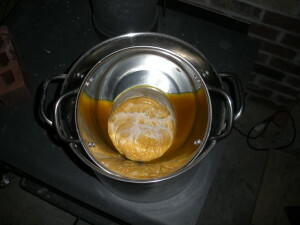 There are additional steps you can do to get really clean wax, but I’m OK with a little of the hive in my wax. What are your favorite uses for beeswax? Back in the days when metal cost a lot more than wood people tried to make joints that did not require nails or screws. One such joint that is very strong is called the drawbore. This type of joint involves some kind of mortise and tenon with a wooden peg through it. However when the hole was drilled for the peg it wasn’t drilled straight through when the joint was together, the holes were offset a bit so when the peg was driven in the joint it would “draw” the joint tighter. This joint was used for hundreds of years and produced some very strong joints. 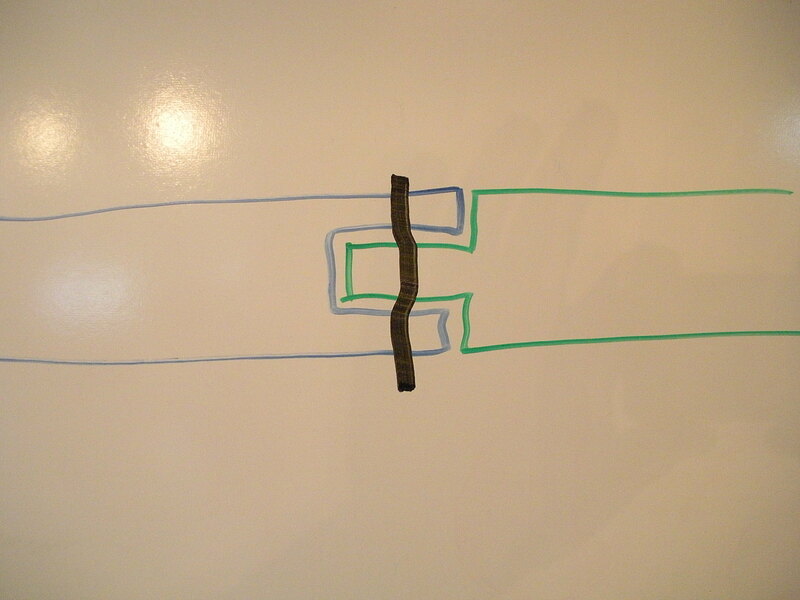 Looking at the crude drawing below you will see two different boards, one green and one blue. 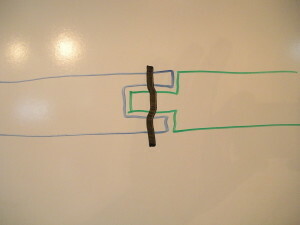 The black line represents the peg and how it is deflected a bit as it goes through the holes that do not quite line up. One thing to note is this type of joint is not conclusive to something that needs to be taken apart and re-assembled. Once a peg is driven in it is hard to get out and since it is deformed it will not have the holding strength if you try to use it again. You could use new pegs, but the joint will not be as strong. According to my cousin the barn on my grandparents farm was framed without any nails. While he was not born yet when it was built he dig spend time repairing/refurbishing it so I’m going to take his work at it. If you get good timber-framers to build you something today you will see this joint used, sometimes with pegs with diameters measured in inches. If you have a project why not give it a try, particularly if you are working with green wood in the round. You might be surprised how tight the joint becomes as the wood shrinks. Popular Woodworking has an article on Drawboring if you want more information. After reading on the internet about a “Swedish Torch” I decided to try it out. It basically involves taking a log and drilling a hole starting at one end about 2/3’s of the way through the log and drilling another hole in from the side to intersect this hole. 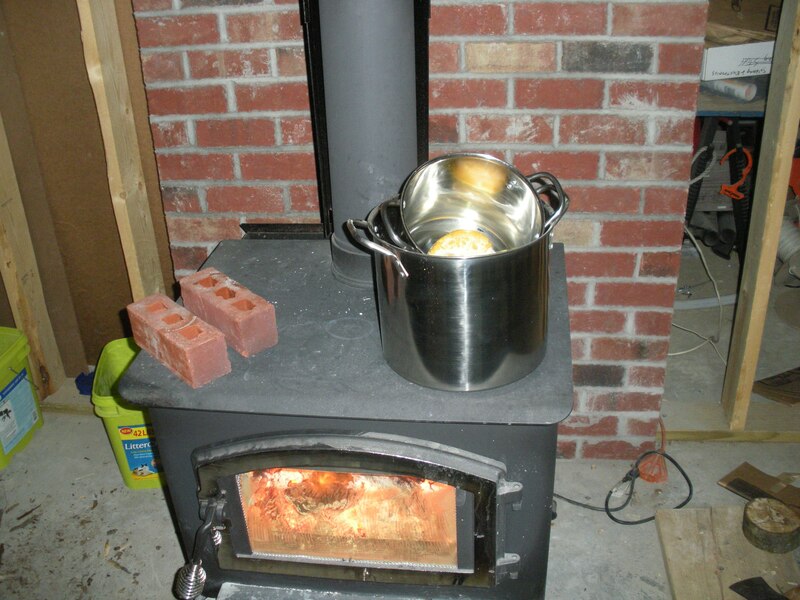 This creates what amounts to a rocket stove, made out of wood. Of course this means it only lasts one fire, but I still thought it would be cool. In the back of my property there is a downed pine tree that I thought had been down for a couple of years and was suspended about 2′ off the ground on its branches, so I thought it would be dry. So two adult men armed with a big drill, a propane torch and a leaf blower tried to make one of these. Blowing the leaf blower into side hole did produce an impressive flame shooting up about 6″, but as soon as I took it away it died down to a smoldering, smokey log and went out completely. To determine the root cause of my failure I took the splitting axe to the log and discovered my problem. The first hit (which didn’t split the log) saw water on each side of the axe. Apparently the log was nowhere near as dry as I thought. There is a standing dead tree I’m going to try it on next. The above picture show the log split in half and we did produce some impressive charring, until you consider we spent 10 minutes of propane torch on it. The video below shows what I was trying to do. A commercial version is the TimberTote and it is supposed to be available at a local superstore called Meijer’s for about $10. If I figure it out maybe I’ll start selling them to the local KOA, $10 for one log is a good price for what is basically firewood and you don’t have to split it, just drill two holes.